Last four years I’ve been doing very interesting large-scale research on print advertising. Have studied carefully over 420 ads on seven different sectors, with two different methods, semiotic analysis and with qualitative research. Aikakausmedia – Finnish Periodicals – wanted to know more about influential print advertising. Why is it, that some ads make so much more influence than others? To find out, we e took 60 best ads of the year from each field. Such that had the best attention values and reading values according to several quantitative research. We wanted to find out their secret: what makes these ads more memorable and more effective than others? Each of the seven sectors was studied separately with a semiotic-qualitative method during 2012- 2016. 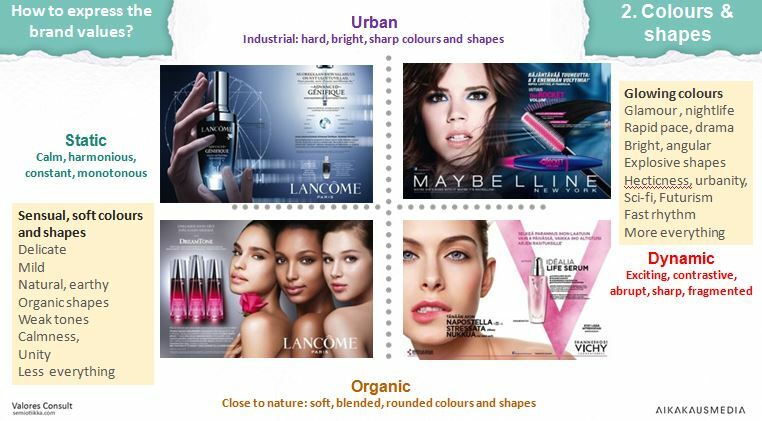 Colours and shapes – the basic visuals of ad – make so much of the message! Myths and stories make a larger-than-life influence – well-chosen and well-implemented myths are just invaluable to the brand image! Sensual experience can win the readers’ heart. Even though the subject of a print ad rarely can be smelled, touched or heard, a good close-up photo can give enjoyable sensory experience to the reader. Clarity and to some point simplicity is the basement of everything. A messy message just doesn’t work. Luscious colours can literally bring water to the mouth of the reader. Different kinds of shapes, visual composition and typographies have different messages. Sharp and lean are theoretical, fast and urban, wheras rounded and fat are earthy, slow and organic, to put things as simple as possible. 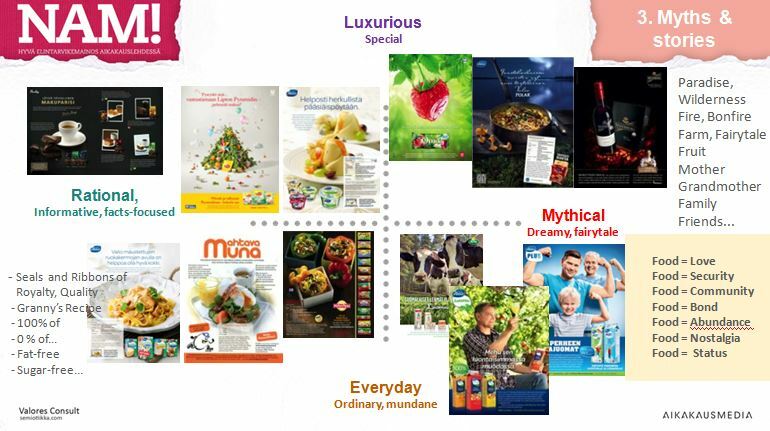 Well-chosen and well-implemented myths are just invaluable to the brand image! Strengthening mythicism and stories in advertising always produces a stronger and more desired brand. Read more in each sector report.